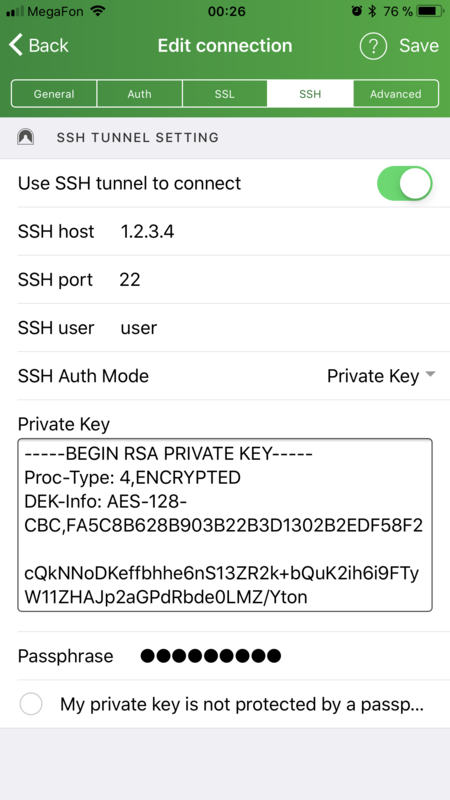 You can leave this empty to create the key in the default location, which is /home/youruser/.ssh/id_rsa, but we recommend to change it to the /Users/youruser/.ssh/mongolime for instance. The public key file will be created in the very same location, and with the same name, but with the .pub extension. 4. Afterwards, you will be prompted to choose a password. This is the password required to use the private key. Your identification has been saved in /Users/bushev/.ssh/mongolime. Your public key has been saved in /Users/bushev/.ssh/mongolime.pub. This logs into the server host, and copies keys to the server, and configures them to grant access by adding them to the authorized_keys file. The copying may ask for a password or other authentication for the server. Only the public key is copied to the server. The private key should never be copied to another machine. 6. Finally, copy-paste content of a Private key file to a the MongoLime connection settings.